I recently sat down with the Cherryland Electric Cooperative Board of Directors. Together, we reviewed an extensive fiber-to-the-home (FTTH) feasibility study for our region. If Cherryland were to run a fiber line past each home and business we serve, the total cost would exceed $80 million dollars. The study determined that out of 35,000 members, there are only 2,783 that are not served with some form of high speed internet. Going one step further, the study revealed that there are 3,834 members who have access to internet but fall into a category labeled “underserved.” I read that to mean that they have service but it is poor at best. Thus, 19% of Cherryland members are either unserved or underserved. A common rebuttal we hear is that members will leave their present provider and switch to Cherryland due to our reputation for reliability and great service. Neither the board nor I are ready to make an $80 million dollar bet on this statement. Our plan is to start slowly with a multi-pronged fiber strategy. The first step is to begin exploring a partnership with Traverse City Light and Power in the Traverse City area. Can we reduce our risk, learn valuable lessons and then expand into the more rural areas? We will begin this process very soon. In parallel with that effort in 2017, we are in the early stages of working with a vendor that has proven capability of providing wireless internet at high speeds in rural areas. Obviously, wireless cannot be as fast or as reliable as fiber. However, the financial risk of such a partnership is minimal and the investment is small. It will also create a real-life survey as to how many people in rural areas are willing to sign up for faster service. We will start this project in the Bates area east of Traverse City as well as the very rural areas of our service territory around Thompsonville, Brethren and Copemish to our southwest. For 2018, we are working on a partnership with Wolverine Power Cooperative to share the cost of putting 30 miles of fiber between a majority of our substations between Bates to the east, Grawn to our south and Lake Leelanau to our north and west. The intent of this fiber string will be to improve our substation communications and system reliability. In 2019 or at the completion of the fiber connection between substations, we will seek a vendor or multiple vendors willing to “light up” the fiber and seek to serve homes and businesses of Cherryland members. Cherryland revenues will come only from leasing/renting excess fiber space. At this time, Cherryland has no intention of becoming an internet, phone or television provider. Also, as we move forward with housing projects and subdivision work, Cherryland will install empty pipe on all underground projects of any size. So, whenever fiber reaches a given area, we will be ready to slide the magic wire down a plastic pipe to homes and businesses. In closing, we will never turn our back on fiber cable. Several areas of our service territory have a strong offering of internet service today. We will all have to be creative, strategic and patient in order to give every member access to faster internet service. Cherryland will do its part while sticking to our core mission of providing safe, reliable and affordable electricity. The statewide feasibility study can be viewed here. Exciting and disappointing at the same time. As one of the grossly underserved, I had hoped for ‘magic’ with fiber. Certainly the delivery method of the future — the exciting part. Living at the end of both the power and phone lines, I knew in my heart of hearts that we’d be last on any list to be upgraded. We chose our location knowing we would never be on the bleeding edge of wi-fi. We’re not going to be like those who move next to an airport and then complain about the jet noise. Happy to hear Cherryland is moving forward and excited for those who will be receiving another outstanding service. Cherryland Electric is so reliable and service oriented that I’d be willing to prepay for service that included internet and cable. Let’s light this candle Cherryland! 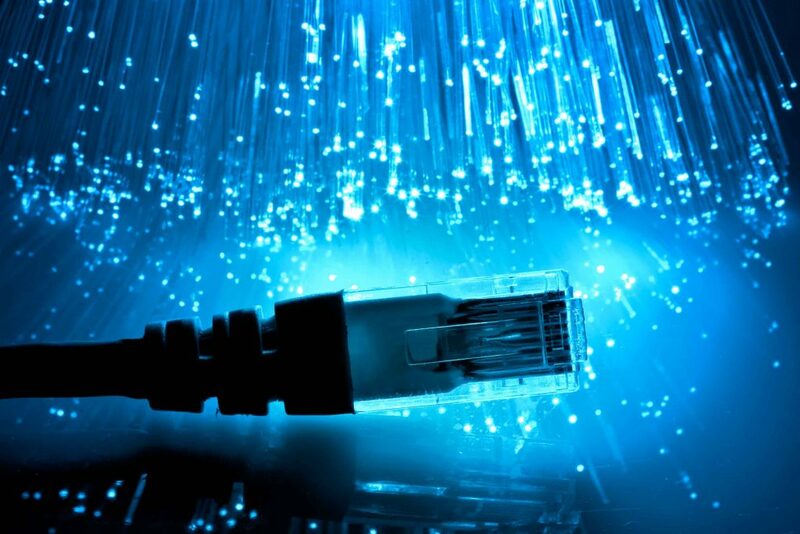 Fiber optic for Internet sounds great, but what would be the cost? Where I live, I went with Hughes satellite , I don’t stream videos, just email, so I don’t care how many gigabytes are offered. I don’t need or want to pay for a Cadillac Plan. I agree with your assessment. As someone who works in IT, it is a constantly changing environment and faster than ever before. While fiber indeed provides some of the fastest internet possible today, the question everyone would love to know is, for how long? Did you guys also look at the future of 5G wireless? That is coming very soon and will completely change IPS speeds as we know it. I believe that 5G will absolutely compete against fiber and provide a solid alternative to running lines to individual homes at a much cheaper cost. Of course, no one has a crystal ball to know what the future holds, but since 5G is already being tested in 11 cities in the US by Verizon, including Ann Arbor, I think it will be here in the next 2-5 years nationwide. Just something to consider in making investments in infrastructure. Thanks for this excellent report! 5G technology isn’t even really about the speed and initially had more to do with connectivity. IoT, Mesh networking and additional towers to fill in the gaps caused by obstructions in large cities. 5G is a hyped up marketing term at this point and doesn’t mean much. 4G was the same way with the introduction of the Sprint Wi-Max technology of the time, which was a joke . There is actually a standard for 4G that was meant to be speeds up to 1 Gbit/sec but wireless carriers have hijacked the terminology and it really doesn’t mean much. We haven’t even come close to 4G speeds when a speed test in Northern Michigan over LTE is generally in the 3-10 Mbps range. All of these technologies are going to require fiber backbones before even thinking about deploying faster wireless. You’re right about wireless though because it is the future. It’s still slowly rolling out from the carriers and maybe Cherryland can find a cost effective way to roll out a super fast wireless service and jump start some competition up here. It’s really not that bad here though unless you live in the boonies. I just moved back here after living in one of the biggest cities in the US and the speed and price of internet is better here. Internet is pretty slow in most of the country. Very disappointing. I had high hopes. I am not in an underserved area, but absolutely HATE charter. Their service and reliability are awful. I even switched providers at one point to a wireless system and paid MORE for LESS speed. Unfortunately, I am now a home that cut the cord for cable and stream a ton of stuff and wireless just could not keep up with charter’s speed. I was truly hoping for another option. We live in the Kaleva/Brethren area and we currently have Kaleva Telephone DSL internet, not fast, but it has been reliable. Your talk of a wireless internet service that offers a slow & unreliable service doesn’t sound rational and I can’t visualize anyone jumping to a service that’s worst than what we have. I wouldn’t. There are plenty of wireless services already. DirecTV is popular in the area and now with AT&T , offer internet deals, but, again, it’s slow. Unless you offer people something that’s a lot better ( streaming capable), save your money. Internet service is available to every one, in some form, be it satellite, wireless, or phone line. Your 2,783 households is most likely people that don’t use the internet ( and I know some that don’t) or just don’t want to pay for it. Hello, I own a home in an unserved area. Can you share information on how I would know when the wireless high speed may be available and through what vendor? I sure hope that fiber optic will some day soon be available to my area, The Shores, Northport Christmas Cove. >If Cherryland were to run a fiber line past each home and business we serve, the total cost would exceed $80 million dollars. $80 million sounds like a big, scary number, but it’s not when you look at it like an investment that will return far more. If I can invest $800 and get back $1000, that’s money well invested. I know that we disagree on ROI, but I don’t think it’s fair to represent this solely as an $80 million expense without considering the other side of the equation. >Thus, 19% of Cherryland members are either unserved or underserved. A common rebuttal we hear is that members will leave their present provider and switch to Cherryland due to our reputation for reliability and great service. You will literally have access to every home with electric service. That is an ENORMOUS competitive advantage. Look at the comments on your own blog posts on the matter. People hate Charter’s customer service – and they love yours…not to mention the inherent loyalty of being a part of the co-op. People will switch for this, alone. Charter’s prices are too high. Based on models presented to TCL&P, which use the price point Conexon advocates for all of their studies, the co-ops would be offering a faster connection than Charter for less money. To get the base 100mbps package that could be offered for $49, people have to pay Charter $130!!! Even Charter’s 60mbps package costs more than the base 100mbps package could. People will switch for that alone. Charter’s upload speed is terrible (vs a symmetrical fiber connection). The best Charter can do for a business customer is a sluggish 7mbps. The cooperative base package would be 100mbps! Anyone who does video conferencing, gaming or file uploading (literally any individual or business engaged in cloud storage) will switch based on the symmetrical upload speed, alone. You have dramatic advantage when it comes to new construction – who’s the first company called when a new home goes in – that’s right, it’s the electric company – and guess who also has awesome Internet to offer? People in rural Northern Michigan are screaming for a fast and reliable pipe. Our cooperatives would be met with the kind of eager consumer demand afforded to few endeavors. There is so much competitive advantage, it’s not even funny. >Neither the board nor I are ready to make an $80 million dollar bet on this statement. You don’t have to bet on anything. Before ever turning a shovel of dirt, Co-Mo went out and got commitments from cooperative members. There’s no reason for speculation if you go straight to the people. >In parallel with that effort in 2017, we are in the early stages of working with a vendor that has proven capability of providing wireless internet at high speeds in rural areas…It will also create a real-life survey as to how many people in rural areas are willing to sign up for faster service. Wireless is slow and fraught with stability issues. This is not comparing apples to apples with fiber and honestly makes for a metric destined to fail as a litmus test of a “real life survey”. >Cherryland will do its part while sticking to our core mission of providing safe, reliable and affordable electricity. Given the increased reliability that comes with smart metering, smart grid, and component communication over fiber – embracing fiber only builds on that core mission. As has been discussed in prior studies, this can be done in a way that is rate neutral to existing subscribers – and as a matter of fact, it usually ends up going the other way, where revenue from the Internet business allows the utility to either maintain or decrease electric rates. Check on “affordable electricity”, as well. Had density logic been applied to bringing electricity to rural areas post Great Depression, your predecessors would’ve looked around and said, “There aren’t many homes here, so it doesn’t make sense to bring in electricity.” It was bringing in the electricity that allowed the population density to increase. The same will be true for high speed Internet. Lack of viable Internet options directly impacts home sales, new construction and the greater TC area being a viable destination for today’s modern workforce. Our future could be full of well-paid knowledge workers and technology professionals contributing to our economy. Only 1.7% of Michigan residents have access to 1 gigabit broadband. Moving forward with fiber to the home would absolutely make our communities a destination of choice for technology companies and professionals. It is impossible to overstate the significance of the decisions being made and the role they will play in the long term economic health of our communities. I am very pleased to see that Cherryland is moving forward in some capacity, but this is inches when we need miles. The “go fast” model is a proven one. The “go slow” model is full of litmus tests that are destined to fail and a far greater stack of dependencies that must be stitched together if world class Internet service will ever be in rural Northern Michigan’s future. Excellent assessment and I couldn’t agree more. I manage 27 remote field consultants now for a software company (used to be one of those field consultants). My communications have been visual via Lifesize Cloud as my team is deployed throughout AMER. Traverse City and surrounding areas is growing and the main ISP is Charter Spectrum. The speed is not great for video calls. You can stand by the sidelines and easiy steal Charter’s customers or wait for Charter to install fiber and lose your window of opportunity (mostly). Well said Josh, couldn’t agree more. Also, interesting to see them point the costs when they are using them as a deterrent, but they don’t give cost estimated of the projects they plan to move ahead with. Is this still coming? Do you have any updates? Hi Dennis – Wireless internet provider 186networks has installed services in some of our unserved and underserved areas using our electrical infrastructure (contact them if you are interested in their services). Otherwise, everything else is moving along as Tony’s column states. No fiber updates at this time.